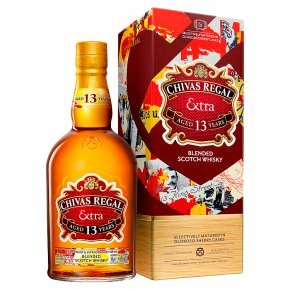 In Chivas Extra, scotch whisky-making tradition and Spanish passion combine to create this extraordinary award-winning blended scotch whisky. It's created with an exceptional blend of rare whiskies combined with malt whiskies aged in sherry casks from the Oloroso sherry bodegas in Spain. The result is the most exceptional of luxury whiskies that's both deep in aroma, rich in fruitiness and generous in sweetness. Sold with its signature gift box, making this the perfect whisky to celebrate a special occasion. Serving suggestion: Best enjoyed as a dram, or served with ice and soda in a highball glass.